Dr. Marmur's investigative work on platelets has resulted in original contributions at multiple levels: clinical, pre-clinical (animal models), cellular, and molecular. Re-analysis of the EPIC database. 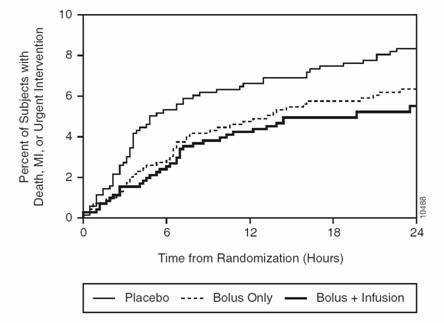 As reported by Dr. Marmur's group, an analysis of the early outcomes in EPIC demonstrates the benefit of a bolus and no infusion. The importance of this concept was highlighted in an accompanying editorial. (Benefit of bolus only AHJ 2006 , , Editorial AHJ 2006 ). II. Results in n=1000 patients. Dr. Marmur's group has also reported their results using a bolus-only strategy in over n=1000 patients. 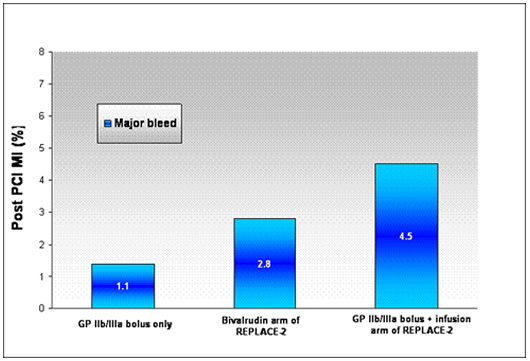 (Bolus-Only Platelet Glycoprotein IIb/IIIa Inhibition during PCI JIC 2006). Data from this study demonstrates that a bolus only strategy can yield excellent results (low rates of periprocedural myocardial infarction and low rates of bleeding) at a very low cost. Although these investigations point to a role for F11R in the pathogenesis of atherosclerosis, there had been no clinical studies to establish a link between F11R and vascular disease in humans. The purpose of Dr. Marmur's investigation has been to determine whether plasma levels of soluble F11R correlate with the presence or extent of angiographically-defined coronary artery disease (CAD). To this end, a novel enzyme-linked immunosorbent assay (ELISA) was developed for the measurement of soluble F11R in human plasma. F11R levels, along with a number of other biomarkers, were measured in 389 male patients with known or suspected coronary artery disease (CAD) undergoing coronary angiography in a Veterans Administration Medical Center . Patients with normal or non-obstructive disease (coronary angiographic score of 0), mild-to-moderate disease (score of 1-3), and severe disease (score of 4-6) had median F11R plasma levels of 38.6 pg/mL, 45.2 pg/mL and 105.8 pg/mL, respectively ( p =0.03 for trend). By multivariate analysis, the independent predictors of CAD score were age, hyperlipidemia, chronic renal insufficiency, left ventricular function, and plasma F11R levels. F11R was the only biomarker to independently predict CAD score. 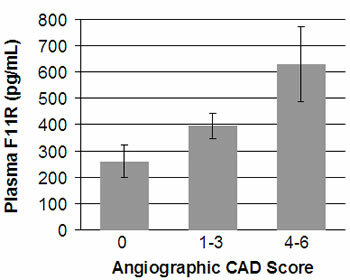 Plasma F11R levels as a function of angiographic coronary artery disease (CAD) score. Results are presented as mean±SEM. P-value for trend <0.05. 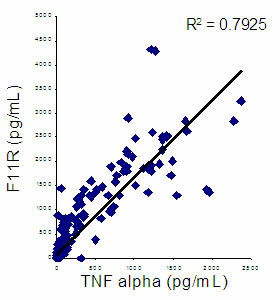 Finally, consistent with the previously reported effects of TNF-alpha on F11R expression in cultured endothelial cells, F11R levels correlated strongly with plasma TNF-alpha levels (r=0.84; p<0.0001). Conclusions : Plasma F11R is independently associated with the presence and severity of angiographically-defined CAD. By virtue of its strong correlation to plasma TNF-alpha, F11R may be an important mediator of the effects of inflammation on the vessel wall. Strategies that block F11R may represent a novel approach to the treatment of human atherosclerosis. Ruggeri ZM. Platelets in atherothrombosis. Nat Med . 2002;8:1227-34. Libby P. Inflammation in atherosclerosis. Nature . 2002;420:868-74. Kornecki E, Walkowiak B, Naik UP, Ehrlich YH. Activation of human platelets by a stimulatory monoclonal antibody. J Biol Chem . 1990;265:10042-8. 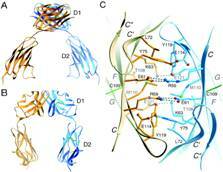 Martin-Padura I, Lostaglio S, Schneemann M, Williams L, Romano M, Fruscella P, Panzeri C, Stoppacciaro A, Ruco L, Villa A, Simmons D, Dejana E. Junctional adhesion molecule, a novel member of the immunoglobulin superfamily that distributes at intercellular junctions and modulates monocyte transmigration. J Cell Biol . 1998;142:117-27. Sobocka MB, Sobocki T, Banerjee P, Weiss C, Rushbrook JI, Norin AJ, Hartwig J, Salifu MO, Markell MS, Babinska A, Ehrlich YH, Kornecki E. Cloning of the human platelet F11 receptor: a cell adhesion molecule member of the immunoglobulin superfamily involved in platelet aggregation. Blood . 2000;95:2600-9. Babinska A, Kedees MH, Athar H, Ahmed T, Batuman O, Ehrlich YH, Hussain MM, Kornecki E. F11-receptor (F11R/JAM) mediates platelet adhesion to endothelial cells: role in inflammatory thrombosis. Thromb Haemost . 2002;88:843-50. Babinska A, Kedees MH, Athar H, Sobocki T, Sobocka MB, Ahmed T, Ehrlich YH, Hussain MM, Kornecki E. Two regions of the human platelet F11-receptor (F11R) are critical for platelet aggregation, potentiation and adhesion. Thromb Haemost . 2002;87:712-21. Basic Science Studies (adapted from Doshi SN and Marmur JD. Evolving role of tissue factor and its inhibitor. Crit Care Med 2002;30 (5 Suppl):S241-S250). Activation of the coagulation cascade was understood traditionally to occur either via the intrinsic or extrinsic pathways. A number of observations in both man and non-human primates suggest that activation of the coagulation cascade in vivo is initiated via the TF pathway. Patients with intrinsic pathway coagulation factor deficiencies, such as factor XI, have normal basal factor IXa generation; whereas patients lacking extrinsic pathway factors, such as factor VII, have depressed factor IX activation. Infusion of recombinant factor VIIa in patients with hereditary factor VII deficiency results in thrombin generation; whereas infusion of factors IX or VIII in patients deficient in these factors does not result in thrombin generation. In addition, generation of thrombin by recombinant factor VIIa is abolished in chimpanzees by pre-treatment with a monoclonal anti-TF antibody, suggesting that activation of coagulation by factor VIIa requires association with TF. These observations point to the predominant role that TF and the extrinsic cascade play in maintaining the basal procoagulant tone of the organism . What, then, is the role of the intrinsic cascade? In the revised theory of coagulation, TF is responsible for initiation of coagulation; however, as a result of inhibition by tissue factor pathway inhibitor (TFPI), the procoagulant activity of TF requires amplification by the intrinsic pathway. Traditionally, activation of the intrinsic cascade has been understood to involve exposure of blood to a negatively charged surface, resulting in a sequence of cleavage reactions culminating in the conversion of factor IX to its active form IXa. According to the revised theory of coagulation, first proposed in the 1990s, blood clotting is initiated by the extrinsic pathway and amplified through the intrinsic pathway . Amplification occurs via two mechanisms. First, factor VIIa of the extrinsic pathway activates factor IX of the intrinsic pathway ( cross-talk ). Second, thrombin activates factors VIII and XI (not shown), as well as platelet surfaces ( feedback ). However, a landmark observation in 1990 established that the TF:VIIa complex is capable of mediating the conversion of factor IX to IXa directly, thereby establishing a link between the two pathways. Thus, TF appears to have a dual role with respect to coagulation: (i) TF initiates coagulation through activation of factor X, and (ii) through its action on factor IX, TF supports amplification. An additional mechanism that supports the importance of the intrinsic cascade is activation of factor VIII through feedback mechanisms involving thrombin (see Aird Crit Care Med 2005;33(12 Suppl):S485-7). Because tissue factor (TF) is the key initiator of blood clotting in vivo, it has been implicated as a central player in the events that lead to a myocardial infarction (MI; heart attack). Specifically, as described in Biomarkers, plaque rupture within a coronary artery is frequently complicated by the activation of the clotting mechanism. Central to this activation is the presence of TF within the atherosclerotic plaque. The seminal observation that active TF is present in human coronary atheroma was reported by Dr. Marmur's group in Circulation in 1996. In this study, directional coronary atherectomy (DCA) specimens from 63 lesions were analyzed with the use of a quantitative TF-specific activity assay. The median content of TF was 10 ng/g plaque (95% CI, 6 to 13 ng/g; range, 0 to 47 ng/g). 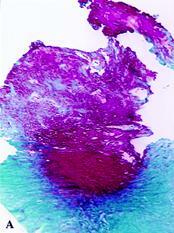 After homogenization of the specimens, TF activity was detected in 28 of 31 lesions (90%). With a polyclonal anti-human TF antibody, the use of immunohistochemistry detected TF antigen in 43 of 50 lesions (86%); TF antigen was expressed in cellular and acellular areas of the plaque. Histologically defined thrombus was present in 19 of the 43 lesions with detectable TF antigen and in none of the 7 lesions without detectable TF antigen (19 of 43 versus 0 of 7; P <.02). 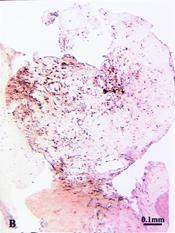 Micrographs of adjacent sections from an atherectomy specimen demonstrating a large area of organizing thrombus (dense red staining of fibrin in A ) containing both cellular and extracellular TF antigen. B : peroxidase-DAB for anti-sTF. Conclusions TF contributes to the procoagulant activity of most atherosclerotic lesions treated with DCA. The association of immunohistochemically detectable TF with plaque thrombus suggests that TF plays a role in coronary thrombosis. Inhibition of TF may represent a therapeutic goal for the prevention of thrombotic complications associated with percutaneous coronary interventions. Dr. Marmur and colleagues demonstrated that not only is TF present in human coronary plaque, but the tissue factor gene may be activated to produce even more TF following angioplasty (Marmur JD et al. 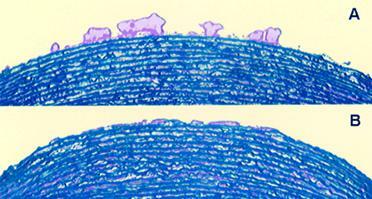 Tissue factor is rapidly induced in arterial smooth muscle after balloon injury. J Clin Invest 1993 ). Further work at the basic science level demonstrated the novel possibility of a gene therapy approach to inhibit coagulation using ribozyme technology against the tissue factor gene. For further details, see Gene Therapy and Genomics . Use of a modified recombinant Factor VII to inhibit the TF pathway. 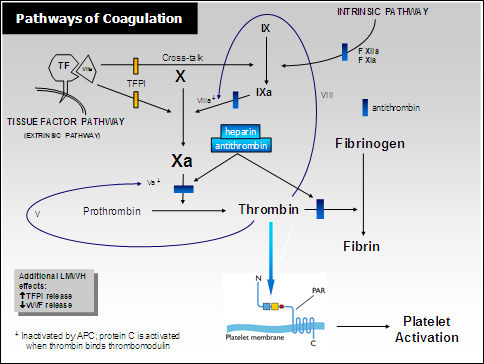 Inhibition of coagulation may be achieved at multiple levels in the coagulation cascade. To block thrombosis at the level of tissue factor (TF; initiator of clotting), Dr. Marmur and colleagues studied a strategy based on a novel form Factor VIIa, designated as FFR-FVIIa. FFR-rFVIIa (NovoSeven) is a modified recombinant factor VIIa (rFVIIa) with the active site irreversibly blocked by a synthetic tripeptide, chloromethyl ketone. The resulting molecule retains its TF binding capacity but is enzymatically inactive. FFR-rFVIIa exerts its antithrombotic effect by competing with native factor VIIa (FVIIa) for TF binding and consequently impeding TF/FVIIa activity. FFR-rFVIIa has been shown to have a higher affinity to TF than native FVIIa. The study performed by Dr. Marmur and his colleagues ( Lev EI, Marmur JD et al. Antithrombotic effect of tissue factor inhibition by inactivated factor VIIa; an ex-vivo human study . Arterioscler Thromb Vasc Biol 2002 ) was a substudy of the Active Site Inhibited Seven (ASIS) trial and examined the antithrombotic effect of 3 doses of FFR-rFVIIa in 24 patients undergoing percutaneous coronary intervention (PCI). Methods : Group 1 (n=9) received 400 µg/kg FFR-rFVIIa and 40 to 50 U/kg heparin, group 2 (n=7) received 200 µg/kg FFR-rFVIIa and 100 U/kg heparin, and group 3 (n=8) received 50 µg/kg FFR-rFVIIa and 100 U/kg heparin. Blood thrombogenicity was assessed as total thrombus area and fibrin deposition on the perfusion chamber at shear rate conditions typical of mild-moderate coronary stenosis. 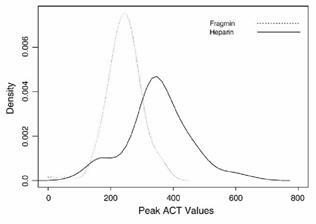 Baseline blood thrombogenicity was evaluated a day before PCI, after heparin administration. A second perfusion chamber study was performed just before PCI, 15 minutes after the administration of heparin and FFR-rFVIIa. Thrombus formation at a high shear rate was markedly reduced in groups 1 and 2 after drug administration, by 79% to 84% and 76% to 87%, respectively ( P <0.004 [group 1], P <0.04 [group 2]). In group 3, moderate thrombus reduction of 46% to 48% was achieved ( P <0.04). Photomicrographs of porcine media exposed to flowing blood. Micrograph A was taken at baseline (after heparin bolus); micrograph B was taken after FFR-rFVIIa+heparin administration. 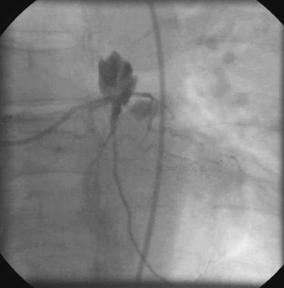 Note the reduced thrombus deposition after the patient receives FFR-rFVIIa. Conclusions : Fibrin deposition in all 3 groups was nearly eliminated after drug administration. Our data demonstrate that FFR-rFVIIa has a potent antithrombotic effect at different shear rates and severe arterial injury conditions. As a practitioner of high risk coronary intervention, Dr. Marmur has consistently advocated the need for monitoring the effects of anticoagulants administered during the procedure. Low molecular weight heparins (LMWH) constitute an important class of agents that were initially introduced to facilitate the non-invasive management of patients presenting with acute coronary syndromes. In the non-invasive setting, it may be true that it is convenient not to be obligated to monitor levels of anticoagulation. However, clinicians ought to distinguish “not being required to monitor” from “not being able to monitor”, particularly in the context of an invasive procedure. One of the main disadvantages of regular unfractionated heparin is the propensity to activate platelets. An example of platelet aggregation to low concentrations of TRAP before and during an infusion of UFH in a patient with unstable angina. Inset shows the results of light transmission aggregometry in platelet-rich plasma from volunteers after adding saline, UFH, enoxaparin, or argatroban. Platelet aggregation to low concentrations of ADP and TRAP is significantly increased in the presence of UFH. *P<.05, **P<.01 vs control. Note the absence of platelet activation in the presence of LMWH or the direct thrombin inhibitor argatroban. It turns out that in fact LMWH administered intravenously, which is probably the only way to reliably and reproducibly administer the drug in the setting of PCI, is indeed quite monitorable. Dr. Marmur and colleagues have shown that the commercially available agents, enoxaparin and dalteparin, reproducibly and predictably elevate the ACT (activated clotting time). See articles: Marmur JD et al, The activated clotting time can be used to monitor the low molecular weight heparin dalteparin after intravenous administration. J Am Coll Cardiol 2003 and Cavusoglu E, Lakhani M, Marmur JD. The Activated Clotting Time (ACT) Can Be Used to Monitor Enoxaparin and Dalteparin after Intravenous Administration. J Invasive Cardiol 2005. A management strategy incorporating these observations is described in the August 2006 Supplement of the Journal Invasive Cardiology , the key points of which are discussed below. Low molecular weight heparin (LMWH) has been a mainstay for the management of acute coronary syndromes (ACS) for almost a decade. However, several recent developments have seriously threatened the prominence of this drug class: (i) the adoption of an early invasive strategy, frequently leading to percutaneous coronary intervention (PCI) where the dosing and monitoring of LMWH is unfamiliar to most operators, (ii) the results of the SYNERGY trial, which not only failed to establish the superiority of enoxaparin over unfractionated heparin with respect to efficacy, but also demonstrated more bleeding with LMWH, and (iii) the results of the REPLACE-2 and ACUITY trials, which have demonstrated the advantages of an ACS and PCI treatment strategy based on direct thrombin inhibition with bivalirudin. To confront these challenges, cardiologists committed to the continued use of LMWH must develop safe and user-friendly approaches to transition patients from the non-invasive to invasive settings. This review summarizes an approach that takes advantage of the fact that LMWH can be readily monitored with the point-of-care activated clotting time (ACT) assay. This assay is inexpensive, available in virtually every catheterization laboratory, and familiar to most operators who monitor unfractionated heparin (UFH). A key concept that is presented is that the ACT is a more accurate measure of LMWH-induced anticoagulation than of UFH-induced anticoagulation. 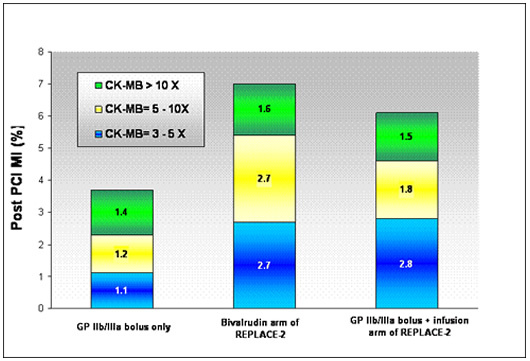 Distribution of ACT levels during PCI. The distribution of peak ACT levels measured at 30 minutes after a randomized bolus administration of either UFH or dalteparin. Note that Fragmin (dalteparin) has a tighter distribution of values. Adapted from Am Heart J . 2006;151:175. Another key concept is that although it is used to monitor agents that possess both anti-IIa and anti-Xa activities, the ACT (and aPTT) are influenced predominantly by anti-IIa activity. Thus, if the ACT is used to monitor bivalirudin, one would expect a dramatic increase, e.g. from a baseline of approximately 110-130 sec to a post bivalirudin bolus of 300-400 sec. In contrast, when using an agent such as LMWH that has a reduced ratio of anti-IIa:anti-Xa activity, the operator must anticipate a reduction in the magnitude of change from baseline values. In other words, it is not that the ACT is unreliable for the purpose of monitoring LMWH, but that it is reliable only after the operator has adjusted his expectations based on the pharmacologic properties of the drug (reflected in the slope of the line in the figure below). as a function of increasing concentrations of anticoagulant in whole blood. Solid lines derived from volunteer blood samples spiked with increasing doses of either UFH ( · ) or dalteparin ( g ). Stippled lines represent theoretic correlations. Because the ACT is most sensitive to thrombin inhibition, the slope of the line increases for drugs with greater anti-IIa properties. Our preliminary work suggests that during PCI operators should target an ACT of 175 seconds in the presence, and 200 seconds in the absence, of adjunctive glycoprotein IIb/IIIa inhibition . Sheath removal is recommended at an ACT <160. A composite of the dose-response of the ACT following intravenous administration of LMWH , characterized by a slope that is approximately one half the magnitude of UFH . Using the UFH ACT targets of 200 and 300s (for patients with and without IIb/IIIa inhibition, respectively), a vertical line started at the drug concentration that is associated with the target ACT for UFH can be extrapolated to intersect with the dose response slope for LMWH. The point of intersection with the LMWH dose response slope would then represent the target LMWH ACT. Based on study observations, and these calculations, we have proposed a minimum target ACT of 175 sec for patients receiving LMWH with GP IIb/IIIa inhibition, and a minimum of 200 sec for patients receiving LMWH alone during PCI. These guidelines may facilitate continued use of LMWH which has the potential to reduce cost (less expensive than bivalirudin), diminish the need for intravenous medication (can be administered subcutaneously in the non-invasive setting with minimal to no monitoring), and provide an ideal anticoagulant during PCI (easy to monitor with the ACT, at least partially reversible with protamine in case of coronary perforation, effective anti-thrombin with no platelet activation thereby potentially reducing the need for routine adjunctive IIb/IIIa inhibition). After documenting a baseline ACT of 121 sec; the patient was given intravenous dalteparin 80 units/kg and abciximab. Five minutes later his ACT increased to 202 sec. Dilatation with a 3.0mm diameter cutting balloon was complicated by perforation. An ACT measured at the time of the perforation (40 minutes after the bolus dose) was 172 sec. Protamine 10 mg was given with a resultant decrease in the ACT to 119 sec. However at 70 mins from baseline, the ACT increased to 133 sec and an additional 5 mg of protamine was given resulting in a decrease of the ACT to pre-treatment levels. A major theoretic advantage of LMWH over bivalirudin is the ability to at least partially (in the order of 60%) reverse the anticoagulant effect with protamine (see Crowther MA et al. Br J Haematol . 2002;116:178-186). Copyright 2006 © Dr. Jonathan D. Marmur. All rights reserved.